What is it this time of year that gives me the urge to drive the backroads to small villages in our area? One reason was the opening day for the fall season of my favorite country gift shop in Ridgeland, WI. Ridgeland is a tiny village nestled in the rolling hills of farm country with a population of 250. 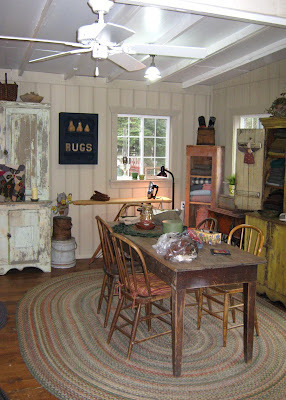 The little shop I visit is in the home of a gracious and lovely lady. 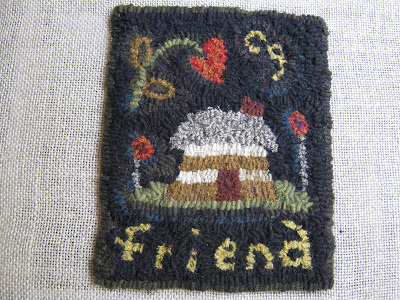 She calls her shop Village Homestead. I never leave there without loading up on fall accents like twiggy bittersweet wreaths, samplers, braided mats, Lang and Legacy calendars, candles, etc. She always has just the right thing I am looking for despite the shop being ever so small. I drive 30 miles to get there and have for many years now. She is so appreciative and you leave there with only good thoughts and the feeling that you are supporting our small cottage businesses. So important in these times. The old general store ( currently an antiques shop) in the photo above is in another little town near Ridgeland called Dallas. Population even less than Ridgeland. The old sign on the side of the building is starting to fade away but the colors are still fascinating to look at. Something about that mossy green against the rust bricks. 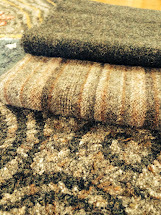 I am visualizing these colors in a fall rug or penny rug. 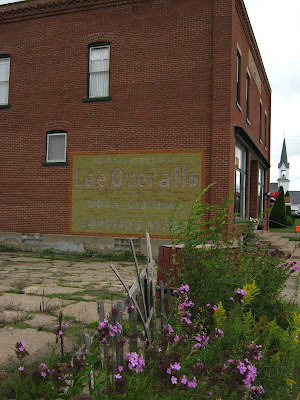 Inspired to look for more colors I spotted another old building across the street that is housing a gunsmith shop. Yes, it is still in business. 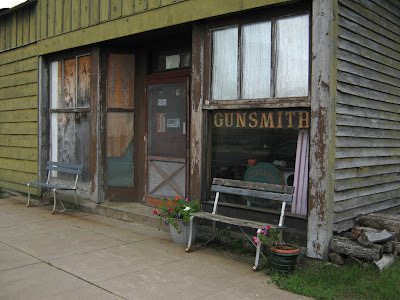 I gather that there is always a need for a gunsmith in these parts. I marvel at these old run down buildings and even more the people who are making a living out of them. There is beauty, respect, intrigue, inspiration if you look for it. It did my heart good today to get in the car and drive the backroads to do business with people who appreciate you and work hard to make a living in the smallest of communities. God bless small town USA. Showing Off What I Won! I can't help myself! I had to show off a little here! 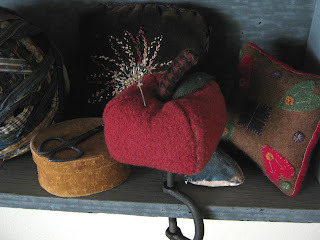 Look at the adorable apple pinkeep I won from Laurie at Prairies Edge Primitives! 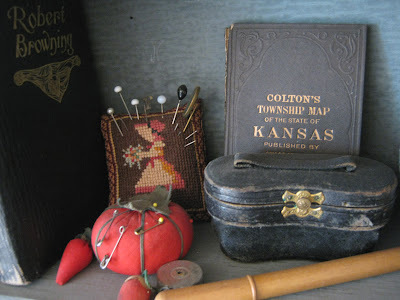 It looks like it's been with my antique sewing and pincushion collection forever! What a treat for me right now! 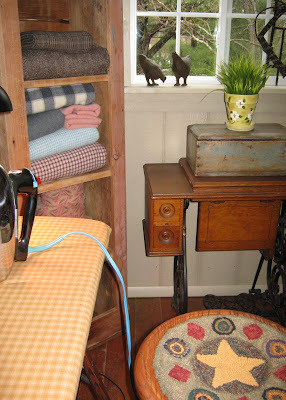 If you haven't checked out Laurie's website and blog you really need to get over there! 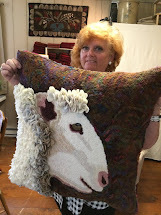 She knows her stuff and her fine high quality shows through in all her lovely wool and designs. I hope to meet her in person soon at the Hook-in in Stillwater, Mn. She'll be the hardworking vendor with the best looking booth I'm sure! 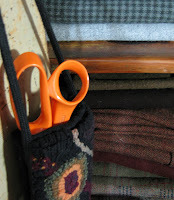 Thank-you Laurie for a terrific give-away on your blog! I haven't signed up for too many give-aways on blogs yet! I have it in my head that I never win anything anyway! But see, there is hope! Anybody can win if I can! I'd like to have a giveaway for something soon on my own blog. But what should the glorious prize be? Hmmmmmm......I know....the Ugly Guy from my last blog post!!! Oh FEAR Not. He will be making a trip via Ebay soon! Maybe my 20th post would be a nice milestone for a giveaway. I'll think of something by then. The Fall season is trucking on in isn't it? 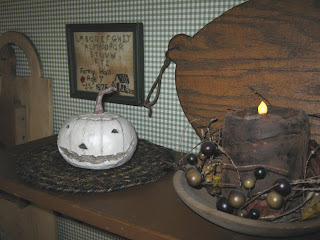 I dug out some of those cute white resin Jack-o-Lantern pumpkins I bought last year and set them about. Just for a hint of Halloween. I don't want to rush it. This year I want to savor each turning leaf, each frosty morning, the sound of acorns dropping on the roof ( or is that noise that dang mouse who insists on perfecting her nest quite noisily in the attic again?) 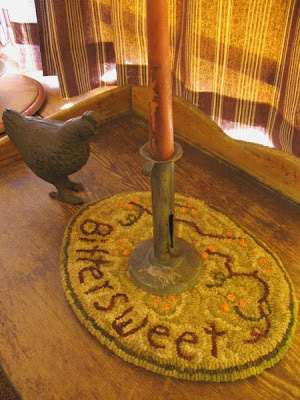 I've just begun to perfect OUR nest around here for the fall season and intend to drag it out till the first snowflake twinkles. My Blog Name and the Ugly Guy in My Basement! 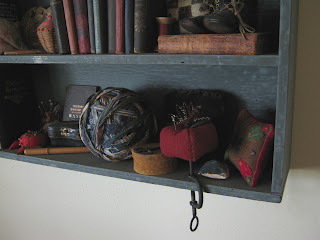 I've had a few inquiries since I've started this blog about the name I chose for it. My apologies for holding you at bay for an explanation. I DO have an explanation...sort of. I promise to reveal it in a future post. Julie, one of my blog followers made a comment that I just love. About the explanation being simple and deep. She has a sharp wit and her observation skills are meticulous! I love her blog called Hookworm too. Today however I am going to reveal something about myself that may lend a clue. It has to do with this guy I found in my basement. 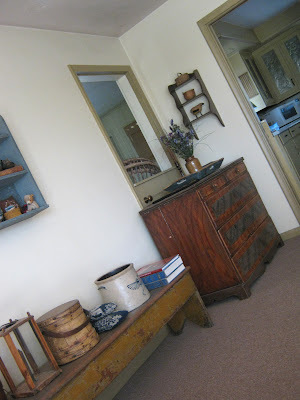 Everytime I go down to do my laundry or get something out of the chest freezer, I take a quick gaze around. I won't be so quick to show you photos of what I see! If I had to pick one word to describe it I guess it would be.......Hmmmm...not coming to me......okay....SCARY. I could sell tickets for a freak show down there or a Halloween extravaganza in a heart beat! I'll say this....that isn't all bad. 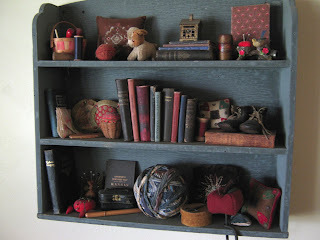 For instance, needing a subject for today's blog, my mind drew a blank. I decided to descend the basement steps(which in themselves are a subject for a future blog) and take a gander around. 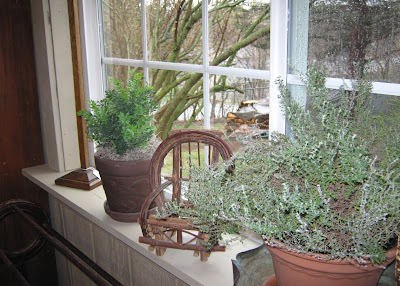 There under a nice pine drop leaf table I spotted something covered in cobwebs. 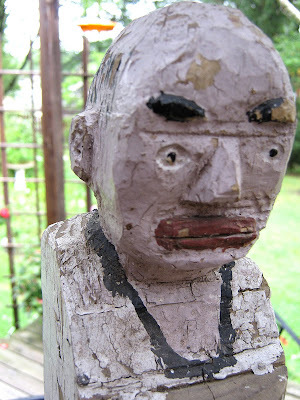 This wooden post with a guys head carved on top. Possibly the ugliest thing I've ever seen. Why is this thing in my basement? Because of my addiction. 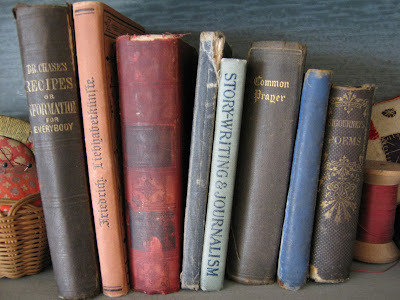 I know from reading other blogs that there are enough of us out there to start a GSA (garage saler's anonymous) group to rival those other blank blank anonymous groups. 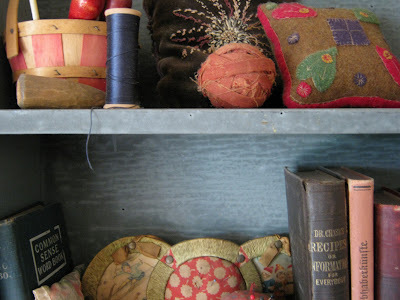 For me, driving past a garage sale sign can bring on hot flashes and cold sweats at the same time. So rather than try and fight my addiction, I have in the past just fed it and put on the brakes. Sound familiar? 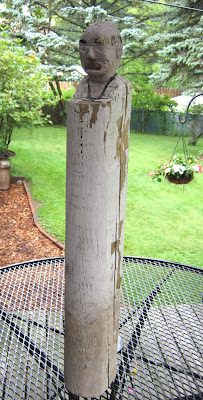 Well, that is why this ugly post guy is in my basement. I don't know what I was thinking. I've picked him up and examined him closely numerous times. Whoever carved this wonder of wonders must have had a very creative twist to his nature. Is it a likeness of someone he knew? Maybe the town cop. Maybe his uncle? Hey, you know..... he does kind of look like..... Okay, just stop it. I know I have to get rid of this thing. But it has been kind of fun to go down in the basement and pick him up from time to time and wonder things. Yea, like wondering how in the heck am I going to get rid of him! Are you thinking what I'm thinking? Heck yes! Put him on EBAY ! Well, I'll be working on that. Right now I have to check on my Mom. She is trying to bake something out in the kitchen......smells good, like cinnamon and apples.....then I have to pick up my neighbor and take her to her eye Dr. appointment. 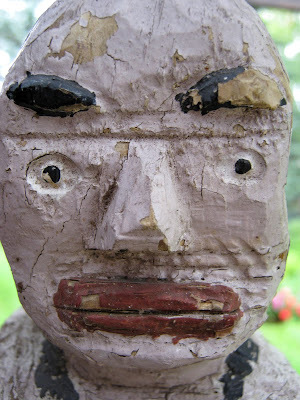 More on the ugly post guy in a couple of days! You know I really know nothing about computers. I just started playing around with all the gadgets out there and what fun I'm having!! This collage of photos I took around our house and yard today feature the color orange. It is Not one of my favorite colors, but then again sometimes I crave it. Especially this time of year. Right now I crave the true, bright orange. But in a few weeks I want to see the softer, rustier mellow shades. Come October I want to see orange with black! But for now.......these are the oranges I live with. 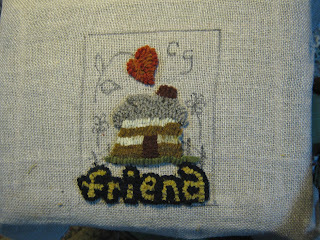 Sh..sh.....sh...my little mat I just started is a birthday gift for a dear friend. She doesn't know yet that I've started a blog! I've been meaning to hook her a little something for quite some time. A few birthdays ago as a matter of fact. 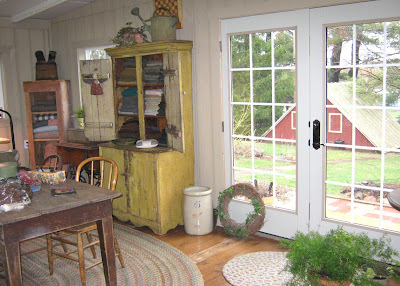 She has the most wonderful little log house built right next to her house on the farm. They dismantled the log cabin log by log on property a few hundred miles away and put it back together log by log on their farm here. I wish I could show it to you. Hence the little log house in the design. Maybe if we're all good and wish her Happy Birthday in the comments to this post she'll let me take pictures of the cabin to show you. 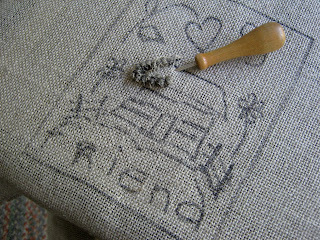 The little mat I'm working on I drew for her. 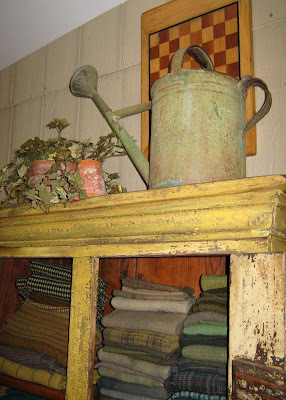 She is crazy for primitives and antiques. 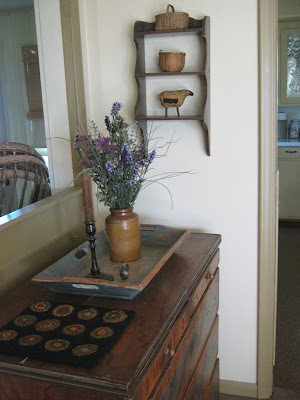 I think the colors I chose will fit in nicely with all her painted firkins and pantry boxes. She has hundreds. So this 10 minute challenge got me going on this and actually I almost have it done! 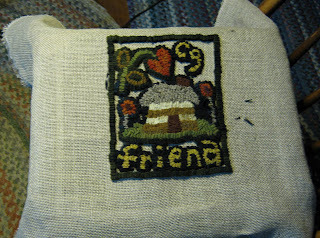 Just need to fix the letter F up a little and fill in that corner and press and bind. 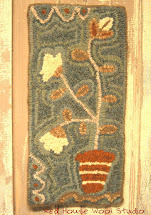 It is a small mat 6 1/2 by 8 1/2 inches. I love doing these small projects. 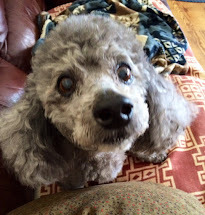 It seems like that's all I can concentrate on these days with caregiving (Mom is living with me for now waiting to have heart surgery and a difficult cataract removal surgery after that). So in between Dr. appointments etc. and taking care of my own family it has become a challenge to even find 10 minutes. I started this blog too which has actually helped me to focus on something else besides all the problems and sickness. So let me know what you think of this little mat. Do you think she'll like it?Happy Birthday Sue! I'm a firm believer that pictures speak louder than words. I think today I'm going to let pictures help you to get to know me a little better. 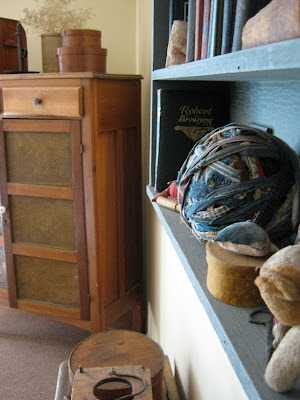 I've chosen a few views around our humble abode to share with you. Welcome! Thank-you kindly for stopping by. 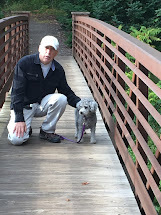 I hope you keep stopping by my blog to get to know me and my family better in the coming days. Blessings! 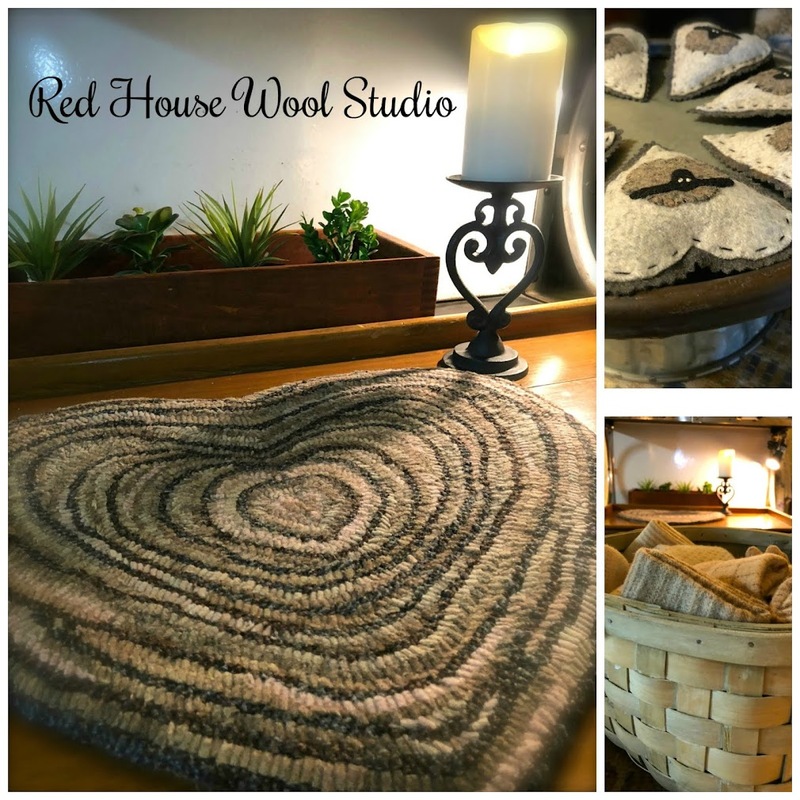 Everyone needs to run right over to Laurie's blog at the Wooly Red Rug http://woolyredrug-prairiesedgeprimitives.blogspot.com and sign up for her too cute apple pinkeep giveaway ... I sure did!!! There's a cool snap to the air that we've been feeling here in Northern Wisconsin all summer. A summer that never really got started. We've had very few days of 90 degree weather, I think maybe two. 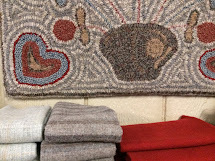 The nights cool down so much that we're closing all the windows and keeping the lightweight quilts on the beds. 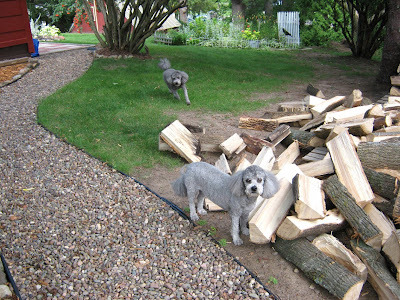 It makes you stop and stare at the wood pile in the back yard. 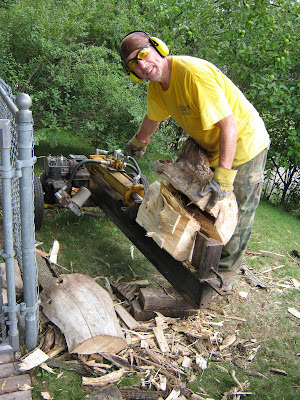 Ya, the one that has only a few chunks of wood left from last winter. We burn wood. As do three of our next door neighbors. 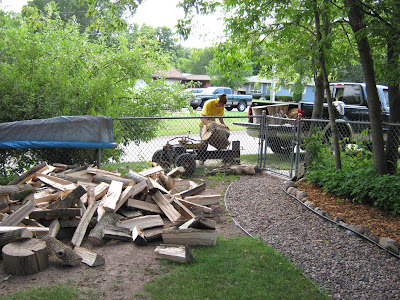 So, keeping up with the Jones' is looking to see how much wood they have on their woodpile! Hubby got a good start on ours last weekend. He is kind of a connoisseur of wood. I like to call him the "Wood Wizard". 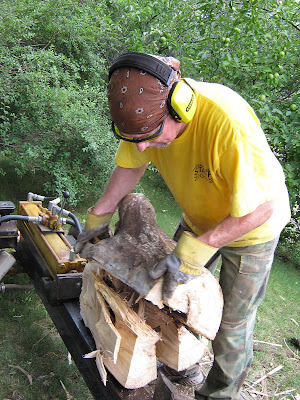 Each year he takes a chunk of each kind of wood he harvests and weighs and measures it. 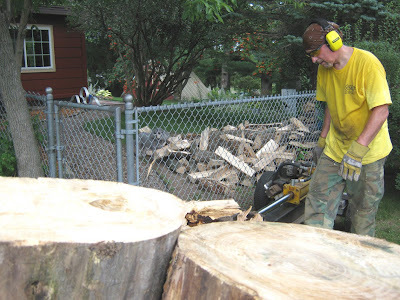 It is then placed on the woodpile to be seasoned along with the rest. Every so often it is weighed and measured again to see how much moisture has gone out. Careful records of all of this are kept. I have a very small part in all of this. He prefers to keep old women and dogs out of his way. 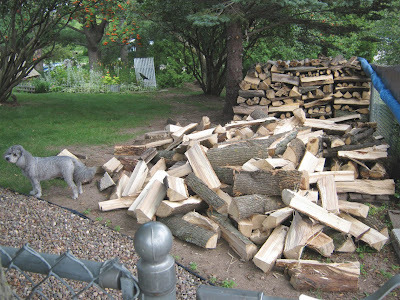 However, I do get to get up in the wee hours of a cold December and January morning to throw some of this carefully seasoned, cut and piled, wonderful firewood into the furnace. Enjoy the photos I took this last weekend! 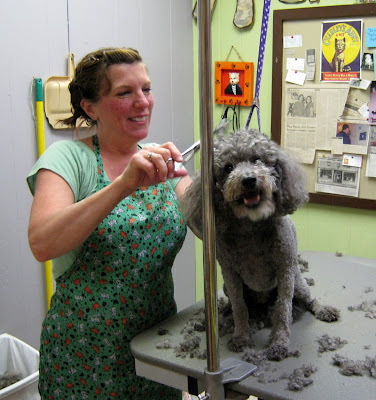 Yesterday was one of our half-dozen trips a year to see Nancy, our beloved friend and dog groomer. We've had our boys Smokey and Max since they were eight weeks old. That was seven years ago. 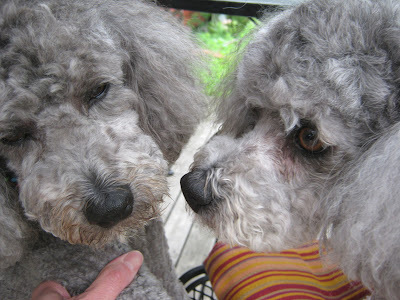 A couple of years ago we found Nancy our groomer. 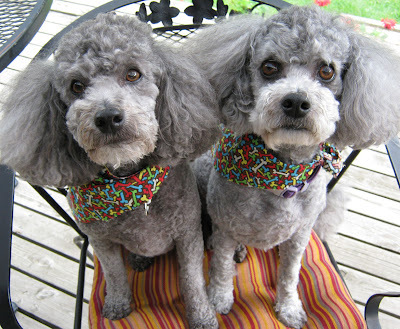 Owning Bichon Poo's, who need regular haircuts and baths, we've found that your groomer better be someone you trust and are comfortable with. Let me tell you about Nancy. The message on her answering machine says" Howdy Do! 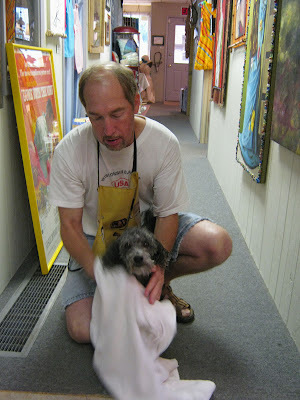 You've reached Rustic Rover Small Pet Grooming, The Dog Dance Center, ART Gallery and Antiques, Nancy and the Backwoods Boys and home of the Dutmers! Please leave a message! WOOF!" 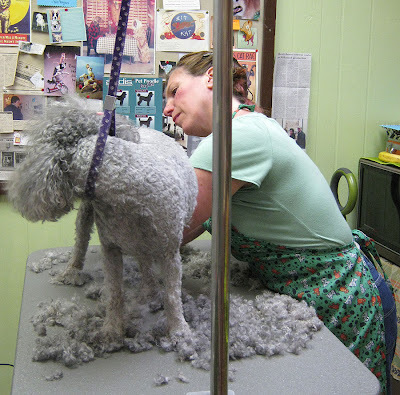 This is one busy dog groomer! Multi-talented, an artist, a musician/vocalist with a voice like Patsy Cline! 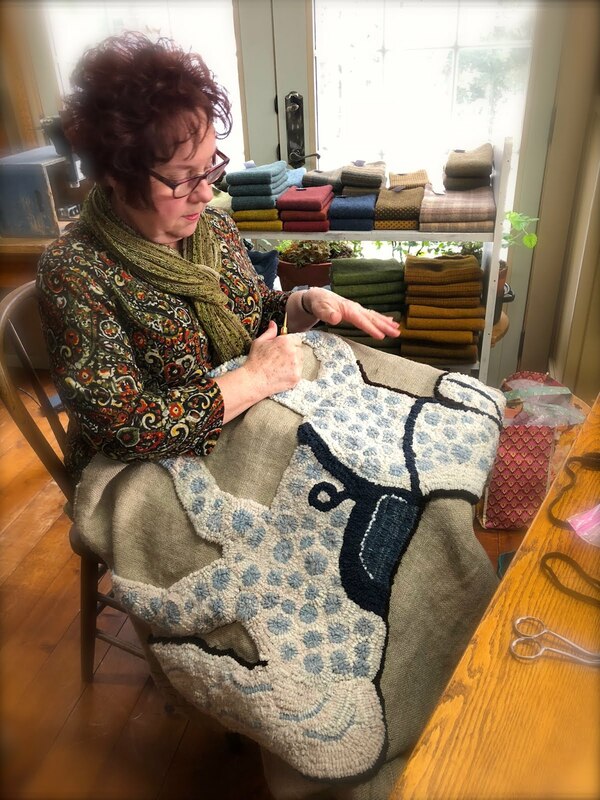 She's running an art gallery, antiques shop, her daughter's dance studio, and her grooming business all in one charming, little building downtown Chetek, WI. A trip there is one magical adventure. A hidden treasure in a small resort town here in the northwoods. Nancy is also lead singer in a band called Nancy and the Backwoods Boys. They are popular and always on the go! Oh, I can't forget to mention she is an actress who performs regularly in the local Red Barn Theatre. Another area attraction housed in a wonderful old red dairy barn converted to a theatre. I need a nap. Back to our grooming appointment yesterday. We were lucky to get this appointment. 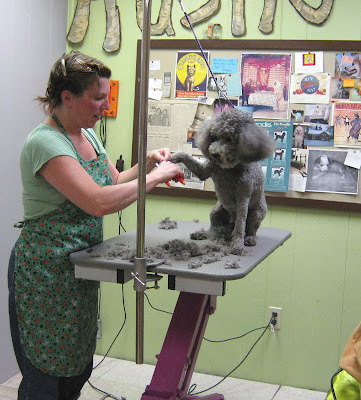 She had calls all morning from locals and tourists wanting to get poochy in for a trim or nail clip. Nancy took us first thing in the morning(bless her) and we arrived at the same time she did. 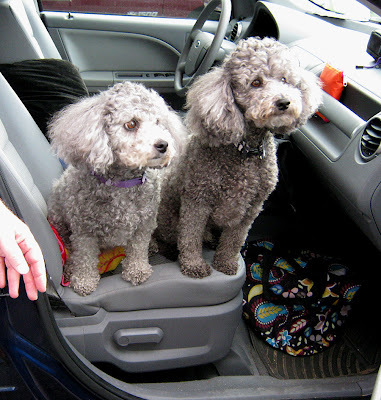 My hubby Dave took one look at her and said to me while prying the dogs out of the car ( they don't share my enthusiasm for going there) "is that Nancy? She looks different?" 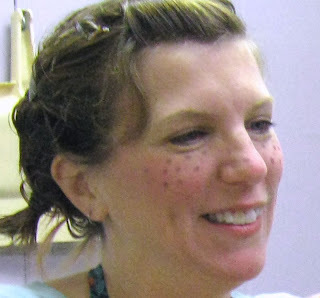 Her hair was pulled back in pig tails and she had huge freckles painted on her adorable face. They were having " Crazy Days" downtown today. The shop owners dress funny to add to the carnival like atmosphere. Hubby always gets a little nervous around anything a little out of the ordinary. Relax honey, get rested up for your job to shampoo the dogs. Oh yes, another reason I just ❤❤❤ my groomer......she let's us shampoo them while we are there! That is just crazy you are saying! Yes I know! But......it saves time, the dogs don't have to sit in the drying cage thingy, and Dave gets to spend quality time with his boys. I think Nancy doesn't mind. At least she is always smiling and telling us it's fine with her! We pay her regular price and all is well. So I've added a few photo's (before my camera batteries went dead) of our day! "Uh Oh! This place again! Do we HAVE to go in there?!!" Let me clip those nails Smokey! Max has to keep an eye on his tail at all times! Oooh! You smell so nice!!! All Clean! We Love you Nancy! We can't wait to go back to Rustic Rover! 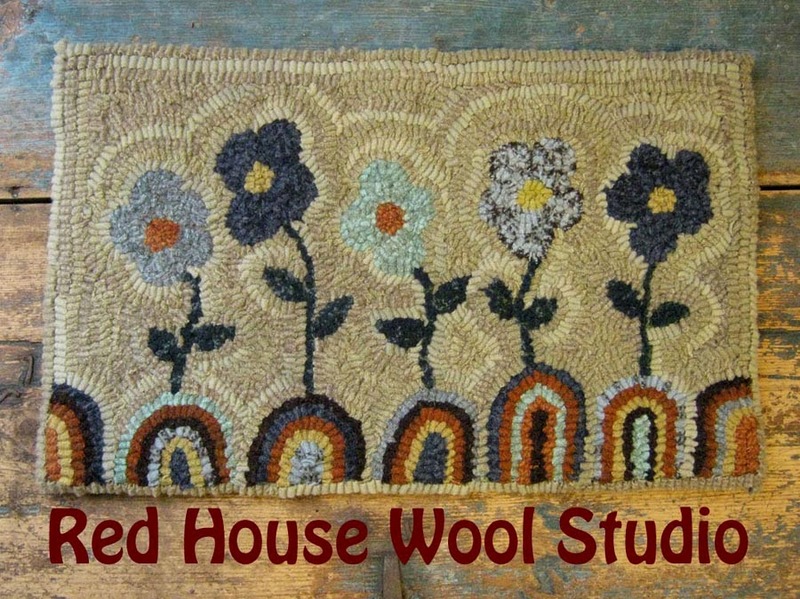 This is a little mat I designed and hooked last year and sold on Ebay. 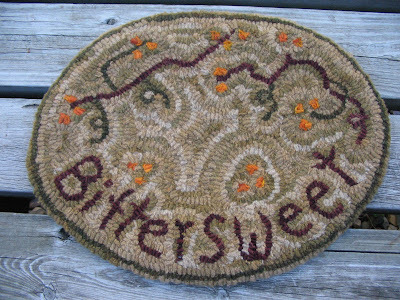 I loved hooking the letters for the word bittersweet. Learning to hook around letters was a mystery to me when I first started hooking. Then my teacher showed me how to do it correctly. I was just amazed how easy it was! 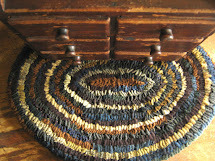 Since then I've tried to incorporate words or letters in quite a few of my rugs. I never tire of hooking letters! 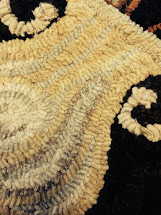 New rug hookers out there, don't be afraid to try it! Just be sure and get someone to teach you how right off the bat! Did you know you can click on the photo's and enlarge them? 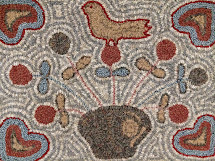 Try it to see the hooking in great detail. Here is the Hummingbird photo I promised. Dave sat out on the deck with his camera one afternoon while these little guys were as thick as mosquitos. The red bee balm I planted there is a favorite of these beautiful tiny creatures. Hello pretty bird! Where have you been? If you read my last post to the end, you know that my friend Lisa's bird Rosie, flew the coop two weeks ago. Well, you probably won't believe this but he arrived home yesterday with nary a feather harmed. Lisa called me crying like a baby that Rosie had been found! I couldn't believe it until I went over there and saw him with my own two eyes. Here's the story which is hard to imagine. Right after Rosie and Lisa's other bird Lilly went missing, she called the local Pet Shop here in town to tell them to be on the lookout for her two Cockatoo birds. I thought that was a good idea but never imagined that anyone would find them alive and actually return them. Such pretty and expensive birds they are. 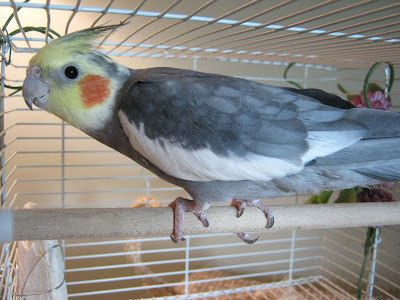 They are really affectionate birds and get very attached to their owners. Well, yesterday morning upon arriving to work, the Pet Shop owners found a shoe box on the front steps with Rosie inside. They didn't know for sure but thought he probably belonged to Lisa. A note on the box said only to please take care of this bird and try to find the owners. The phone call to Lisa's husband sent him to tears and he frantically tried to get Lisa on her cell. It's obvious these Cockatoo owners get as attached to their birds as the birds to them. As soon as Lisa got the news my phone was ringing. 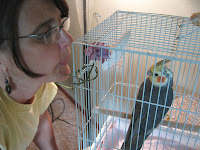 I grabbed the camera and got to Lisa's to find Rosie safe and sound and talking up a storm in loud bird garble to Lisa. It was as if he was trying to tell her about all the places he'd been and all the things he'd been through this past two weeks. Perhaps about the nasty crows in the neighborhood who chased him through the tall pines that grow here. So now we have Rosie back with us but still no sign of Lilly. After witnessing this episode of bird returns home, I now believe that it's entirely possible that Lilly can follow the flight of her partner. One can only hope, but in the meantime I know where there is one happy Cockatoo and his even happier human Mom and Dad! As summer wanes here in northern Wisconsin, I am realizing how precious the sights and sounds of the season are to behold. 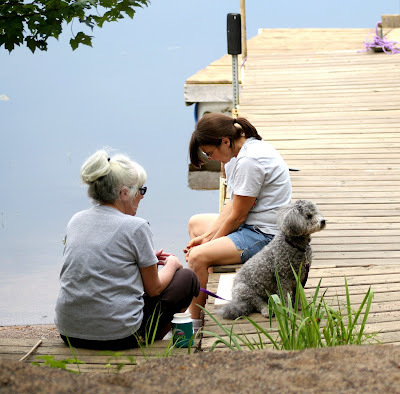 My hubby Dave captured a couple of moments while we were visiting my friend Lisa at her cabin the other day. 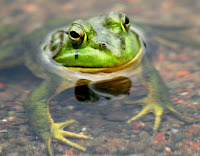 A gorgeous green frog, the loons calling, the day was as perfect as they come. Lisa and I along with one of my dogs Max, sat on the dock. Lisa my friend, you have been a Godsend these last few months while dealing with my Mom's illness. Countless times I have called her when I felt like I just couldn't deal with any more. She came flying at the drop of a hat when I was at the vet with my dogs and couldn't make it home in time for Mom's eyedrops. It's so nice that her house is only a couple of hundred feet from mine! About two weeks ago both of Lisa's pet Cockatoo birds accidently escaped out her door. The neighbors and friends all around have been calling for Rosie (a male) and Lilly( female) while searching the treetops with our binoculars. What's funny is, we have two older ladies living in the neighborhood that are named Rose and Lilly. How funny is that....However, I think they thought it was a bad joke that everyone kept calling their names all hours of the night and day! I told Lisa last weekend she better just get over it, those birds probably were never coming back..................more on that later. 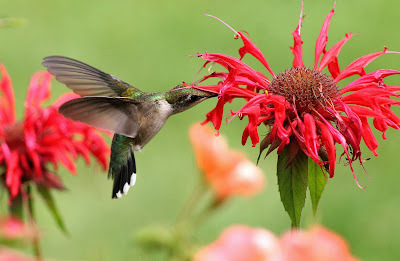 I wanted to add a couple of gorgeous photos Dave took of hummingbirds out on our deck the other day, but I am so new to this blogging format I can't figure out how to get them to load at the bottom instead of at the top of my blog. 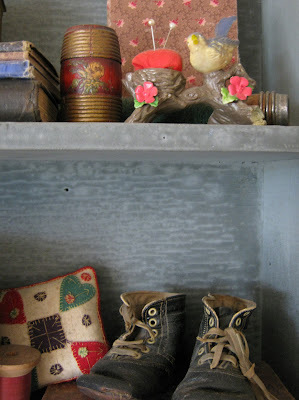 I am trying to make this blog look somewhat professional, for a total non-professional...sheesh!! So look for the hummingbird photos in a seperate post for now I guess. 10 minutes you say? Count me in! This challenge is just what I needed to get some of these UFO's completed. Well, at least on their way to completion. 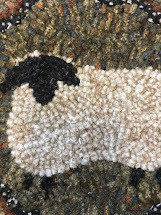 Normally I am not one with a lot of rugs started and not completed. Recently I became a care giver. My Mom, whose 78 became ill on Mother's Day this past May. She is living here now, facing heart valve replacement soon and a difficult cataract removal after that. I am thinking now that with winter approaching she may be a winter resident here. Life changes with the blink of an eye you see. I faced many challenges these past few months with her in the hospital for a month and a nursing home stay for a month. Countless Dr's appointments now and medications, eyedrops, trips to the coumadin clinic, etc. etc. 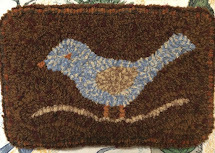 Rug hooking has always been a therapy for me of sorts. Needless to say, I need some now. 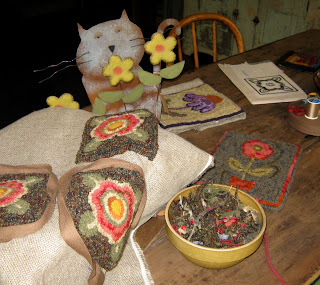 The above photo is a quick snap of some coasters that I started right before Mom got sick. Actually I was thinking of giving them to her for Mother's day. If I get them finished now I may still get the opportunity. So 10 minute challenge here I come. See if you can stop me now! 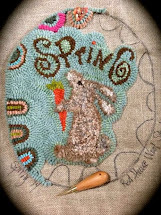 This great idea of a 10 Minute Rug Hooking Challenge was started by April DeConick of Red Jack Rugs! Be sure and click on her link under Blogs I Follow down there in the corner for more info.